The handsome gentleman in 19th century attire pictured here is Albert Augustus Gifford. He is the man who kept the whaling journal while on the Bark President. The journal is now in the collection of Westport Historical Society. Albert was neither the captain nor the first mate on the President but one of three boatsteerers or harpooners. The picture we have was taken in Melbourne, Australia in the 1863. The bark President’s homeport was Westport. Her owner was Andrew Hicks. Her master was Edward Soule of Westport. The chief mate was from Dartmouth, William Howland. But the second mate was Westporter Rodney Wainer and, of course, our Albert A. Gifford came from Westport. 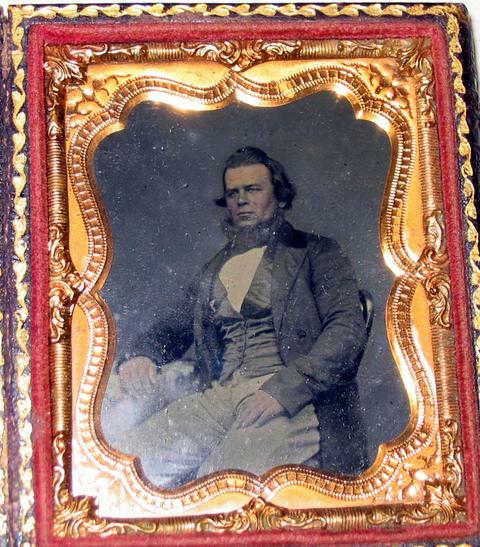 His is a personal journal and records a relatively short trip as whaling voyages go. The President sailed from New Bedford on May 26, 1849 and returned on August 22, 1850. They had good hunting. Whenever a whale was caught the journal is stamped with a picture of a whale. One page has six stamps indicating six whales caught on one day. They spoke some 26 ships, several of which they saw a number of times. One such ship was the Shylock. By coincidence the New Bedford Whaling Museum has a log of the Shylock in which a sketch was made of the President the day they spoke it. Interestingly enough another of the ships that communicated with the President was the Westport brig Mexico, a ship Mr. Gifford had sailed on earlier as an oarsman. His journal for that earlier voyage is also in the collection of Westport Historical Society. About the second week of the voyage Gifford notes seeing the wreck of a ship floating by and later in the journey he records seeing the same ship once again. On June 9th they got their first whale and the journal also reports three men sick with the measles, a fourth took sick a week later. June 17th Captain Gifford of the Dr. Franklin out of Westport came on board. August 13th they put letters onboard the Jane Howes which was returning to New Bedford. This was a rare opportunity to let friends and family back home know how they were faring. And the August 21st entry reports that they had fine sport catching dolphin. Apparently there were few whales around that week. In mid September they came to Fayal in the Azores to take on fresh meat and vegetables. November 4 -17 they were at St Vincent where the governor came onboard to dine with the captain after having gone fishing with him. During this stay in Saint Vincent Gifford comments several times about a lot of “rum flying about.” Also in November the cabin boy suffered some kind of fit and was put to bed for some days. In March of 1850 they returned to St. Vincent to take on water. Here they worked with the Willis taking a cow and calf. They had some trouble getting some of their crew back on board. There was a fight between a forward hand and a boatsteerer. The journal does not say which boatsteerer was involved. But the most notable entry in the log occurred on August 2, 1849. It was a horrible day for the crew! One whale fought mightily for his life. 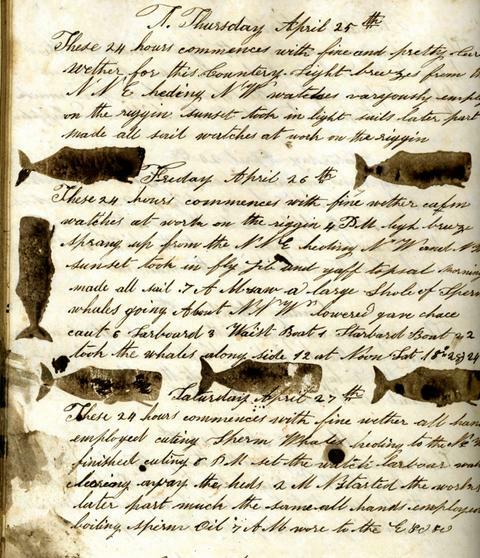 The journal records “lored (lowered) wast (waist) boat struck Starboard boat went on to him got stove whale took one Ansel Juel in his Jaw never saw him after.” Poor Ansel H. Jewel was making his first whaling voyage as a green hand. He was from the small town of Norway, Maine. He would have been an oarsman in the stove boat and was snapped up by an angry, desperate whale that got away from his would be killers. Gifford makes but only a few personal comments in his journal. Three times he mentions dreaming of his beloved bride and home. Once he dreamed that his wife had died and another time that his wife was being married to another man and that he saw the wedding guests and that he had used her wrong and that he was sorry. On July 22 he notes that it is his birthday and that he vows to be a better man and live a different life. He makes no note of Christmas or Easter in his journal. And what do we know of Albert Augustus Gifford? He was born July 22, 1825. He married Lucy Ann Sowle on April 23, 1848. When the bark President began its voyage Mr. Gifford left behind his bride of a year and one month and an infant son, Lafayette Leroy, not yet two months old. He would not be home to see the boy take his first steps or say his first words. Gifford’s father Anthony Almy Gifford was a whaling master but Albert never achieved that rank. After his voyage as a green hand on a ship under his father’s command, he was listed as an able seaman on the brigs Catherwood and Mexico, then boatsteerer on the Metacom (1845-1848) and the President (1849-50), later second mate on the ship Herald (1851-1855) and on the bark Mattapoisett of Westport (1855-1857). He continued to sail but we do not, at this point, have a record of the rest of his voyages. His wife Lucy died May 29, 1852 at the tender age of 25. He was at sea on the Herald when she died. He did not return until 1855. In that same year he married Sarah Sowle and sailed again on the bark Mattapoisett, returning to Westport in 1857. His second child was Almeda Jane Gifford, born in 1858. His second wife notes in the back of the journal he kept while on the Mexico that he sailed again in 1859 and she notes that he sailed for New York in 1868. According to the unverified information supplied with his picture, he was in Melbourne, Australia in 1863. We do not yet know much about his career at the time of the Civil War, a devastating time for New England whaling. A considerable amount of scrimshaw is attributed to Albert A. Gifford and his journal mentions at least one day spent scrimshanding. 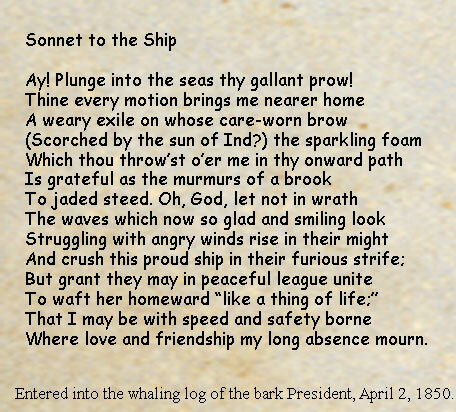 Although his spelling is phonetic and not always standard, the fact that he quotes Lord Bacon and possibly wrote a sonnet himself while at sea (see below) suggests he had considerable education. His scrimshaw, interest in sonnets and the watercolors of the Azores in his Mexico journal suggest an artistic nature. Hopefully further research will elucidate events in the latter part of his life. He died October 22, 1884. This entry was posted in People, Whaling Activities at Westport Point, Whaling folks.